Although the films of the prolific Hong Kong auteur Johnnie To are most often discussed in the context of his own work, and of Hong Kong and Asian genre cinema in general, there are other fruitful comparisons that can be made. To, in fact, is one of the closest contemporary analogues we have to such old Hollywood masters as Howard Hawks, John Ford, or Otto Preminger. These directors, like To, may be associated with particular genres, but their mastery and immense talent ran across many different types of films. In To’s case, his distinctive stamp – enhanced by his frequent collaborations with a recurring stable of actors, writers, and crew – stretches across such disparate work as cop and gangster sagas (the “Election” films, “Exiled,” “PTU”) and frothy romantic comedies (“Yesterday Once More,” “Don’t Go Breaking My Heart”). To’s mastery is evident even when he’s working on minor material, which is the case with his latest, “Three” (三人行). A return to his familiar milieu of cops and gangsters, “Three” continues To’s experiments in combining theatrical and cinematic space that was a major hallmark of his 3D stage adaptation “Office.” Confined mostly to the single setting of a hospital ward during one tense night, “Three” fascinates in the way To works within self-imposed limitations and well-worn genre tropes, attempting to tease artistry and interesting variations out of these materials. And while the results ultimately don’t approach such superior films as “The Mission,” “Running on Karma,” “Exiled,” or “PTU,” there’s still plenty here worth spending time with, and in one particular sequence, some pure cinematic pleasure. The “Three” of the English title – a shortening of the Chinese title “Three People Walking,” which quotes Confucius’ “Analects” – refers to the three principal characters, who form the main triangle of conflict. 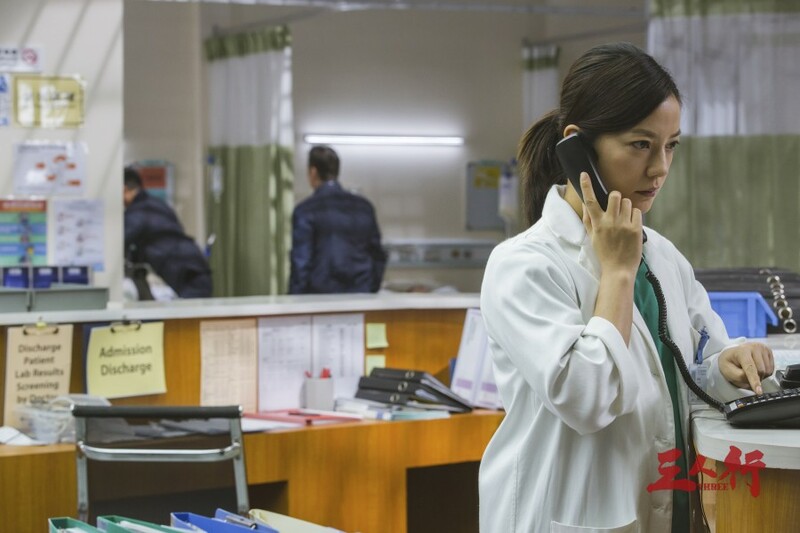 First, there’s neurosurgeon Tong (Vicki Zhao), who starts out already having a bad night, being berated by one patient who believes he’s become paralyzed as a result of the risky operation Tong performed on him. Later, she’ll lose another patient on the operating table, prompting her superior to tell her to take a break from the stress of surgeries and her obsessive drive to prove herself, which may be jeopardizing the well-being of her patients. The other two legs of the triangle arrive together in the hospital as nemeses who draw Tong into their pitched conflict. Shun (Wallace Chung), a captured criminal, is rushed into the hospital, closely followed by his arresting officer Inspector Chen (To regular Louis Koo). Shun has a bullet lodged in his brain, and has a very limited window in which to operate to prevent his death. However, Shun refuses surgery, instead taunting Chen with long philosophical riffs quoting Bertrand Russell and other great thinkers. Shun’s also stalling for time so his armed robbery gang cohorts can arrive to break him out of the hospital. Despite its trim 87-minute running time and compressed time frame, “Three” unfolds with a slow-burn, digressive quality, taking the familiar phrase “operating theater” quite literally as other characters weave themselves in between the principals, including patients, Chen’s police colleagues and superiors, and Shun’s assassin assistants embedding themselves among the hospital residents, waiting for just the right moment to strike. Although there are other points of interest here – a detective and an assassin trading whistled refrains of Mozart’s “A Little Night Music,” and a shot framed from inside an internal bullet wound – the rest of “Three” unfortunately doesn’t rise to the level of that shootout sequence. Also, it’s all wrapped up a little too quickly and abruptly, the haste of this denouement almost undoing the careful dramatic construction preceding it. Still, Johnnie To on a slightly off day is still miles ahead of many other filmmakers on their best. “Three” screened at the 2016 Fantasia International Film Festival on July 15 and 18. It was also recently released in North America; for current and future U.S. and Canada playdates, visit distributor Well Go USA’s website.